Tom grew up in England where his father introduced him to the mountains by taking him on cold, drizzly yet amazing adventures to the highlands of Scotland, England and Wales. He moved to the United States with his family around eight years ago where a road trip from Texas to Colorado ‘blew his mind’. The incessant draw of the high places urged him to pack up his Jeep in Texas and drive North to the Great Land, where he began to pursue a career as a Mountain Guide. 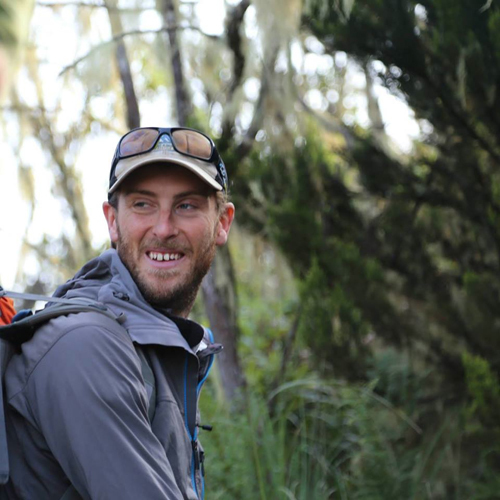 Charming and bright Tom is an exceptional guide on Kili after an outstanding 2014 season. He has led Kili trips for many years with great success on multiple routes. He has been guiding and instructing in Alaska, British Colombia, Argentina, and Tanzania Since 2008, including 20 expeditions on Kilimanjaro, 13 expeditions on Aconcagua, 6 expeditions on Denali, and 2 expeditions on Mount Fairweather. The mountains and harsh environments are his spiritual home and he loves every moment spent amongst them. During his time off he can be found climbing snow, ice and rock in Alaska, Utah, Washington and Nevada, helping out on the ranch in the heart of Texas, and enjoying long romantic walks on the beach. His favorite drink is shaken, not stirred! Tom is an American Mountain Guide Association (AMGA) certified single pitch instructor, an Alaska State certified EMT 1, and an Industrial Rope Access Trade Association (IRATA) Level 1 Certified Rope Access Technician. Aconcagua (22,841ft) via Vacas Valley (13 expeditions). Mount Fairweather, (15,300ft) Alaska (2 expeditions). Kilimanjaro (19,340ft) via Machame and Lemosho routes. (20 expeditions). Mt. Emmerich, Alaska, via Southwest Face (AI3+, 5.7, First Ascent). Peak 5300, Alaska, NE ridge traverse via SE face (Alaska grade III, first ascent). Mount Saint Elias, Alaska, attempt. AMGA Single Pitch Instructor certified. Emergency Medical Technician 1 certified. American Red Cross CPR & First Aid. Industrial Rope Access Trade Association (IRATA) level 1 Rope Access Technician. Yes, I enjoyed it a lot. There were several “classy” touches in this trip that truly separated from similar trips I have taken with other companies. For example: this was my 2nd time climbing Mt. Kili. I used a very reputable company the 1st time, which is known to cater to high-end clients. I can tell you that this Kili trip was well above my previous one in every respect.